Freedom Road Socialist Organization (FRSO) extends our condolences to the family, friends and comrades of Fidel Castro, and to the Cuban people as a whole for this tremendous loss. Fidel Castro was a revolutionary who fought against seemingly impossible odds and won. He led a guerrilla movement against the vicious U.S.-backed Batista regime which governed Cuba in the interests of U.S. imperialism while Cuban workers and peasants suffered harshly. Despite experiencing defeats in its early days, the revolutionary movement learned lessons, rebounded and won national liberation. Fidel played a key role in leading the revolutionary movement to victory. The 1959 revolutionary victory in Cuba inspired people throughout the Americas and the world to fight for liberation in their own countries. The Cuban revolution created the conditions for incredible gains for the Cuban people, despite it being a poor country. The revolution swiftly solved problems that capitalism can’t solve. Illiteracy and starvation were wiped out in Cuba and the best education and health care systems in the Americas were created. This continues to this day in socialist Cuba and stands in stark contrast to Cuba’s neighboring countries which are dominated by imperialism. The Cuban revolution, under the guidance of Fidel Castro and his comrades, also unleashed a boundless internationalism and sacrifice in support of revolutionary movements and attending to human needs throughout Africa, Asia, Latin America and the Middle East. The exemplary internationalism displayed by Cuba over decades - providing whatever they could and asking nothing in return - leads to the enthusiastic embrace of socialist Cuba and its leaders such as Fidel Castro and Che Guevara throughout the world. U.S. imperialism had no intention to stand by idly and let a revolution survive on the small island nation which the U.S. had held as a colony just 90 miles off its coast. Barely in its infancy, the Cuban revolution faced invasion from U.S. imperialism at the Bay of Pigs in 1961. 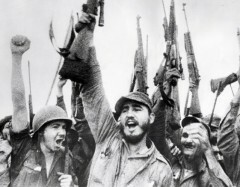 Under Fidel’s leadership, the U.S.-led military invasion was repelled. The U.S. government lashed out, imposing a barbaric economic embargo which continues to this day. U.S. imperialism has engaged in countless acts of sabotage against the Cuban revolution and hundreds of assassination attempts against Fidel Castro personally. But they failed to stop the revolution. They failed because of the collective leadership of the Communist Party of Cuba, of which Fidel was a key leader. Fidel Castro became a communist and adopted the ideology of Marxism-Leninism through learning from experience in making revolution. As the Cuban revolution confronted concrete problems about how to move forward, Fidel saw that only socialism could solve the problems of the Cuban people, and that Marxism-Leninism provided the theory and practice that could guide the revolutionary process forward. Once he adopted Marxism-Leninism, Fidel never wavered. The Cuban revolution faced its most trying period in the 1990s when it was left politically and economically isolated. Fidel Castro led the way in Cuba’s difficult decision to hold firm to Marxism-Leninism, anti-imperialism and proletarian internationalism despite the incredible difficulties they knew they would face. They confronted those difficulties and overcame them when very few thought it would be possible. At that time Cuba was isolated on the world stage and in the Americas. The U.S. government tightened the noose by making its blockade more severe, hoping to end the Cuban revolution once and for all. But through staying true to principle and continuing to struggle ahead with dignity, Cuba was able to turn isolation into its opposite. By 2014 it was U.S. imperialism that was isolated in the Americas while Cuba had many friends, and in the U.N. General Assembly nearly the entire world had voted repeatedly for the U.S. to end the unjust blockade of Cuba. In the face of this isolation, the U.S. finally admitted its decades-long efforts to defeat the Cuban revolution had failed, and took initial steps to normalize relations with socialist Cuba. But the unjust U.S. blockade remains in place and the struggle continues to end it. It is clear that comrade Fidel Castro’s death is weightier than Mount Tai. He lived and died for the Cuban people and for the working class and oppressed peoples around the world. He was a revolutionary, a communist, a Marxist-Leninist. Because of the example of Fidel Castro and the Cuban revolution, we know another world - a socialist world - is possible. Fidel’s example inspires us to continue to support the socialist revolution in Cuba, and carry forward the struggle against imperialism and for socialism in our country.